I passed on this when it first came out for no real reason. Well, there is one reason. 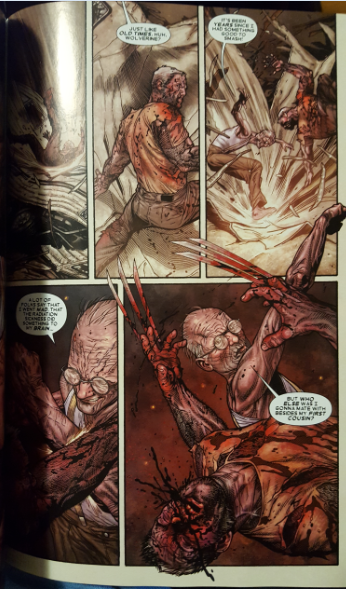 Wolverine has been mutilated beyond recognition by writers who have played carelessly with this toy over the years, leaving him broken and unrecognizable from his original version. I like the stubborn, temperamental brawler that was introduced in the works of Len Wein, Chris Claremont, Dave Cockrum, and John Byrne. As time went on Claremont became bored with what he considered to be a two-dimensional character and he decided to add layers to him. All of a sudden he was a ninja, which was cool because it was the mid-80s and I was a kid. Ninjas were everywhere and they were cool. Cripes, even G.I. Joe introduced ninjas in 1984. Then he developed this worldview and wisdom that defied earlier characterizations. People grow and change, so I can overlook this one. Then his healing factor made him omnipotent. His healing factor was always cool but not without limit, as we see Logan get vaporized by a Sentinel in the Days Of Future Past arc. Then he became almost immortal thanks to Origin, becoming a couple hundred years old. We can't forget how stupid the bone claw addition was in Fatal Attractions, can we? There are more bad Wolverine stories than there are good ones, so I guess that is the reason I passed on this. I passed because I couldn't stomach the endless ret-cons and changes that have occurred since I fell in love with the character. Someone could make the best Wolverine story ever and I wouldn't notice because all of these changes have made me look the other way. 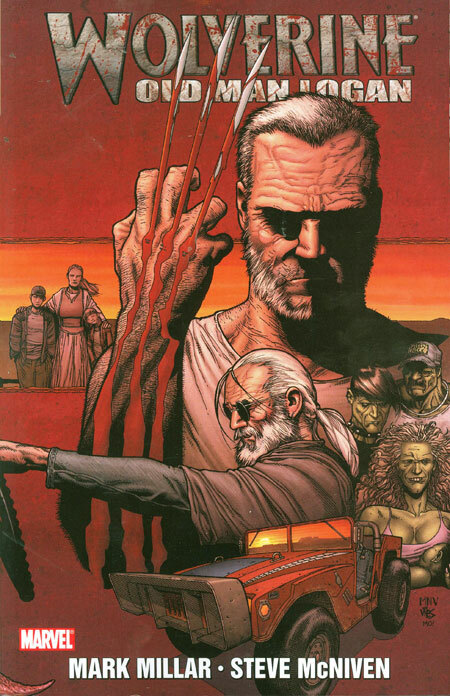 The Logan in this story doesn't contradict the Logan that I grew up on. He is older and wearier and seems resigned to his fate. He has settled down and has a family. In many ways all of us who are settled into family life are like Old Man Logan. We don't want to be bothered with all of the nonsense and just want to be with our kids. But screw with us and our kids and SNIKT- the claws are popped and we are ready to throw down in a heartbeat. 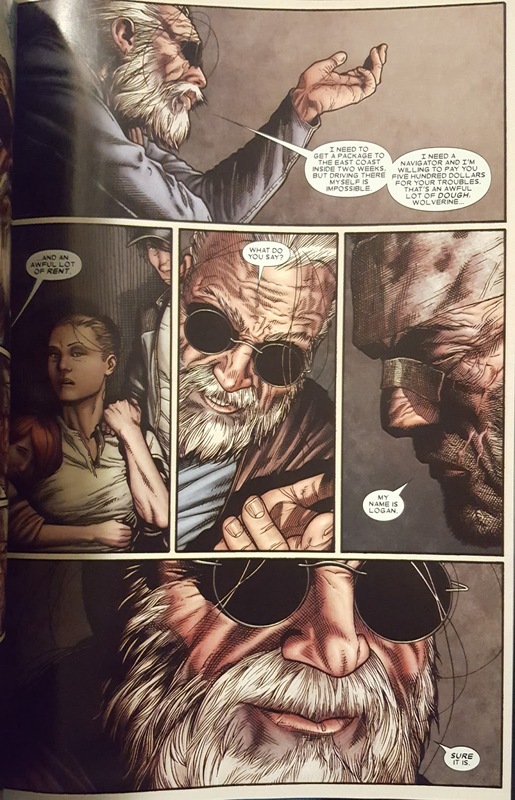 Old Man Logan deals with a timeline 50 years into the future where the villains have finally organized themselves and killed off all of the heroes. The handful of heroes who survived have gone into exile. Logan has sworn off violence, refusing to pop his claws under any circumstances. He has settled into being a farmer with his wife and children but has run out of money for rent. This is when Hawkeye shows up. Hawkeye is now nearly blind and needs Logan to help him deliver some mysterious package to the other side of the country using the old Spider-Mobile from the Gerry Conway/Ross Andru run on Amazing Spider-Man circa 1974-1975. The Spider-Mobile is one of the goofiest footnotes from the Bronze Age of comics. It's ridiculous, but the fact that Hawkeye is still relatively spry is even harder to swallow. The general consensus is that 10 years have passed in Marvel time since Fantastic Four #1 in 1961. I believe that it would be closer to 15 years by this point (2017), but I'll go with their conservative estimate of a sliding timescale of a decade for the sake of argument. Hawkeye first appeared as a villain circa 1964. I guesstimate his age to be at least 18-20 years old in that first appearance. Add close to a decade of Marvel time, and that puts him at 28-30, possibly older depending on exactly when the villains launched their attack on the heroes since it is in a hypothetical future. Add another 50 years to that, and you have a nearly 80 year old Clint Barton. Hawkeye is far too spry in this story for me to buy that. Let's assume that Hawkeye has engaged in the intensive regular exercise that all non-augmented Avengers undergo. I've seen 70 year old guys who go out running everyday, but even they don't appear to be as hearty as ol' Hawkeye is in this series. I don't buy it. S P O I L E R S in the following paragraph. Another sticking point, and this is the big one, is that Mysterio tricked Logan into killing the X-Men during the villains' attack on the heroes by fooling all of his senses. Unless someone was helping Mysterio or his powers get a serious upgrade in between the present and the future where this event takes place, this is outside of Mysterio's power set. I don't buy it, either. Complaints aside, this was a very enjoyable read. Mark Millar and Steve McNiven have always produced good stuff like the original Civil War. I enjoy Mark Millar's writing even if I don't always agree with his characterization (see Iron Man in 2006's Civil War). 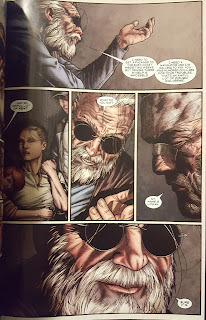 Steve McNiven does brilliant work (the aforementioned Civil War and Captain America, among others), and the pair's reputation was enough to push the needle to buy after a friend of mine raved nonstop about it. If you take this on it's own, as a standalone story not necessarily rooted in continuity, it's great. If you try to fit the jigsaw puzzle piece into the big picture you're going to have force it in. Your mileage, as always, may vary. I'm just one guy with one opinion. You spends your money on it and read it, you got an opinion. It didn't make my eye twitch, if that helps. 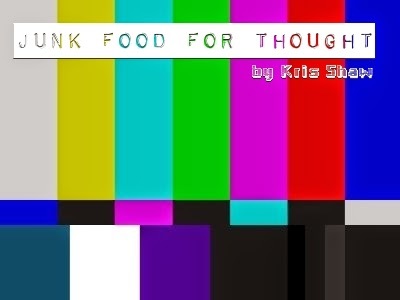 Junk Food For Thought rating: 4.25 out of 5. Paper stock: Fair weight semi-glossy coated stock. Cardstock cover notes: Laminated cardstock. The cardstock is thin and it sort of curls upward once you are done reading it.